Let’s be real: I love Fiona Apple. So, if you’re looking for an unbiased review of her new album The Idler Wheel is Wiser Than the Driver of the Screw and Whipping Cords Will Serve You More Than Ropes Will Ever Do, or as it’s come to be known in pop culture, The Idler Wheel, you’re not exactly going to get it here. Fiona Apple’s fourth studio album was released on 19 June 2012, containing 10 songs in just over 40 minutes. Shortly after its release, The Idler Wheel received critical acclaim from almost every publication that matters. Fiona Apple hasn’t released an album since 2005’s Extraordinary Machine, and in New York City she was able to sell out numerous shows in record time months before talk of a new album was really prominent. There hasn’t been this much excitement around a comeback since Lauryn Hill’s short-lived, mysterious tour appearances in 2011. Fiona Apple is easily one of the most important names in the history of popular music, and her brand of introspective, dark, jazzy rock-pop has inspired an indie music generation. Fiona Apple has left her mark on artists varied as Feist to tUnE-yArDs to Metric to Jenny Lewis to even Florence & the Machine. I know that’s a big statement to make, but the elements of everything that make Fiona’s music so memorable – deep lyrics, haunting melodies, a voice that doesn’t leave you, musical talent for days and the freedom to talk about emotions or feelings that exist outside love – are cornerstones of so many of the newer female musicians, typically of indie persuasion, that we see these days. I had been hearing and reading about how amazing The Idler Wheel was from most of the news sources I trust when it comes to talking about new music prior to really listening to the album myself. All the positive press combined with my deep love for Fiona made me prepared to totally love the album, in a way that only a fan can, kind of forgiving any flaws I might find. Taking as objective as an approach as possible, though, I can tell you this: there is simply nothing to have to forgive Fiona for in regards to this album. Evident from the very first song on the album, the quietly melodic, haunting lead single “Every Single Night” through the last song, a crazy layered vocal and harmonization piece called “Hot Knife”, it’s clear that while Fiona may have been silent all those years, she has never lapsed in musical talent. “Hot Knife” is actually my favorite song on the album, just because I think it takes Fiona into an uncharted musical territory and really allows her vocal talent to shine in starkly beautiful way. There are several other standout tracks on The Idler Wheel as well. “Left Alone” is lyrically so plain and on point, allowing her strength as a jazz musician to really come through while the composition catches your attention. “Anything We Want” perfectly showcases her unique vocal vulnerability and somehow simultaneous ability to control the song, and the drum arrangement adds an upbeat element to an otherwise kind of sad song. “Valentine” returns to the kind of When The Pawn… era Fiona Apple that I love the most; this song is the best platform for the captivating synergy of haunting lyrics, powerful voice and accompanying piano craftsmanship to really work on The Idler Wheel. I dare you to listen, really listen, to The Idler Wheel and dislike it. Especially if you’re able to tell me how to get “I just wanna feel everything” out of your head after the album ends, please let me know. Nice review. It’s been on my to do list for a while, guess I gotta bump it up a notch. Absolutely kicking album. And a great review! Do you know why she was off the record scene for so long? And Jacob, I’ve read a lot about her and from what I can glean from different publications is that she spent the better part of five years trying to record Extraordinary Machine, but hated all the producers her record label had working on it. So with this record, she wanted to take her time and make sure it was exactly the way she wanted it with sound, lyrics, etc. so it just took some time to get right. 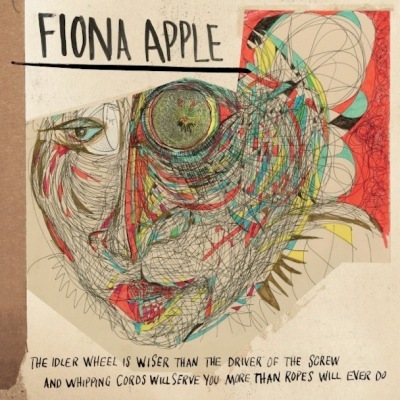 This entry was posted in Music and tagged Fiona Apple, The Idler Wheel, The Idler Wheel is Wiser Than the Driver of the Screw and Whipping Cords Will Serve You More Than Ropes Will Ever Do. Bookmark the permalink.